It is an old adage that “we are what we eat.” Current research is proving that this is no old wives tale especially when it comes to our brains. 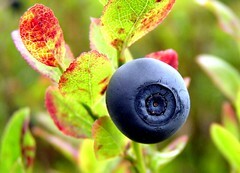 The Peninsula Medical School and the University of Reading studied the ability of blueberries to improve memory. The results of this research showed that fruits like blueberries, which are high in phytochemicals, can improve and even reverse age-related memory deficits while offering many other health benefits for the body. The studies also show that improvements are possible for both long term and short term memory function. To date, the mechanism of how fruits like blueberries improve memory and brain function is unclear, but it is believed that the phytochemicals they contain cross the blood brain barrier and affect learning and memory by enhancing existing neuronal (brain cell) connections. The researchers are also suggested that the improvement in memory is directly related to stimulated “signaling proteins” that can be found in the the hippocampus. The hippocampus is the part of the brain that controls memory and learning. Additional research has pointed to not only the beneficial effects of blueberries, but also to the Acai berry as a powerful brain food. Acai berries are rich in antioxidants, but in addition, have high levels of essential fatty acids. Such large amounts of essential fatty acids is odd for a berry, but great since it is vital for efficient brain function. In the berry family, the Acai berry has the highest antioxidant level which makes them a super brain food. The cacao bean is also being reported by some of the top health experts as the most exciting health food. Unfortunately, the benefits of the cacao bean are not as powerful in the form of a chocolate bar or Americans would be a lot healthier! The beans must be consumed after minimal processing. Ingesting a 1000% organic powder form of cacao is the best way to experience its wonderful benefits for the brain. It is probable that more in depth research will lead to an increase in organic, minimally processed cacao products that can be found in the marketplace. As one can see, although the blueberry is quite popular among fruits, it is not the only fruit that positively affects the brain. In reference to the previously discussed blueberry study, patients who added blueberries to their daily diet over a period of 12 weeks noticed improvements in their mental function, specifically spatial working memory, in as little as 3 weeks. The additional good news about blueberries is that besides the benefits it provides for memory function, you can enjoy this healthy snack daily and your entire body will reap the benefits of its antioxidants. The researchers from the Peninsula Medical School and the University of Reading plan on performing future studies involving Alzheimer’s patients and the effect that flavonoid rich foods have on memory impairment. It is the hope of many researchers that they can unlock a secret that will lead to more effective treatments for Alzheimer’s patients and slow the progression of the disease. Karen Vieira, MBA, PhD, has written about medical research, medical procedures, food ingredients, herbal remedies, pharmaceutical drugs, condo construction, real estate and computer consulting to mention a few.